Phramonkolthepmuni (Sodh Candasaro), the late abbot of Wat Paknam Bhasicharoen, was the founder of the Thai Dhammakaya(dharmakaya) meditation school in 1914. Phramonkolthepmuni was born as Sodh Mikaewnoi on 10 October 1884 to the family of a rice merchant in Songpinong district, Suphanburi: a province 100 km. to the west of Bangkok. He was popular amongst all who knew him for his perseverence, honesty and generosity. At the beginning of July 1906, aged twenty-two, he was ordained at Wat Songpinong in his hometown and was give the Pāli name Candasaro. As a student Phramonkolthepmuni was a disciple of two traditions, unlike most of his contemporaries, and studied under masters of the oral meditation tradition as well as experts in scriptural analysis. He started to study meditation on the day following his ordination, and after his first rainy season was to travel far and wide in Thailand in order to study with all the renowned masters of the time. He later moved to Bangkok to study the Scriptures. He completed the highest level of meditation practice in each school within a short period of time. Nevertheless, he was still not satisfied with his own competence in meditation, convinced that there must be something further that could help a man attain Nirvana in the same way that was possible in the time of the Buddha. In the twelfth year of his ordination, he moved to stay at Wat Bangkuvieng, Nonthaburi Province during the rainy season. Here, he began to practice meditation as his own master using the Visuddhimagga. He reflected to himself that he had been practising meditation for eleven long years and had still not understood the core of knowledge which the Lord Buddha had taught. Thus, on the full-moon day of September 1914, he set himself down in the main shrine hall of Wat Bangkuvieng, resolving not to waver in his practice of sitting meditation, whatever might seek to disturb his single-mindedness. He realised that holding such a vow might cost him his life, but acknowledged that he could not continue to be considered worthy of a monk’s status, unless he could fulfil this act of utmost dedication. He meditated using the mantra ‘Sammā-araham’ and was surprised that before long he experienced unprecedented degrees of pain, with a severity as if the bones of his body were being torn apart. With great perseverance, he managed to let go of the contingent agitation of mind and found that his mind engaged a new level of peace, coming to a standstill at a nucleus of concentration at the centre of the body. At the centre of the body, there was a bright spherical structure of about the size of an egg-yolk. Accompanying this experience, inexplicable bliss filled his body rinsing away all the agony. His mind remained in unshakeable concentration upon the bright spherical structure throughout the day, whatever he was doing. Meditating again far into the night, he allowed his mind to go deeper and deeper through the pathway at centre of the sphere until he discovered the dhammakāya, the most refined of the inner bodies which is eternal and free from defilement. 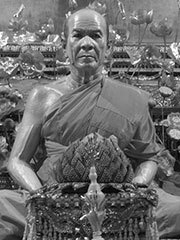 Phramonkolthepmuni devoted the rest of his life to teaching and furthering the depth of knowledge of this meditation technique. It is this technique which has become known as ‘Dhammakaya meditation'(i.e. meditation for attaining the dhammakaya). In 1916, Phramonkolthepmuni was appointed as the abbot of Wat Paknam Bhasicharoen, and here he devoted his time to researching the insights of Dhammakaya meditation and refined the technique to make it more systematic, through experimenting with the ways the meditation could best be applied for the common good. During an exceptionally long ministry of over half-a-century, Phramonkolthepmuni was unflagging in teaching all-comers the way to attain to dhammakaya. With activities nearly every day of the week. He recognised the need to open-up and re-develop the oral tradition of meditation teaching which was becoming disorganised and scarce in Thai Buddhism. He gave the chance with the technique, for every meditator to verify for themselves, in their first-hand experience, the success of the technique. Indeed, Phramonkolthepmuni would challenge others to meditate in order that they may verify for themselves, the claims which he made about the technique. It was the response to this need which led to the innovative building at Wat Paknam of the ‘meditation workshop’. He designated that this workshop should be kept in use by meditators, for 24 hours-a-day: day and night and selected from amongst his followers, the most gifted of the meditators. Their ‘brief’ was to devote their lives to meditation research for the common good of society. Phramonkolthepmuni was taken ill in 1956. At this time, Phramonkolthepmuni brought the work of the meditation workshop to an end by dismissing all of the meditators except for four or five of the most devoted nuns. It was these nuns who were the heir to the oral tradition of Dhammakaya when Phramonkolthepmuni passed away in 1959, aged seventy-five.